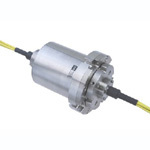 Fiber Optic Rotary Joints or FORJs provide a connection between two or multiple fiber optic cables and permit free rotation between them along the axis of the cable/s, preventing cables from becoming twisted. Important properties for fiber optic rotary joints include, low insertion loss, small insertion loss variation and high return loss. Once submitted, we will try and place you in contact with a suitable Fiber Optic Rotary Joints supplier within 48 hours.